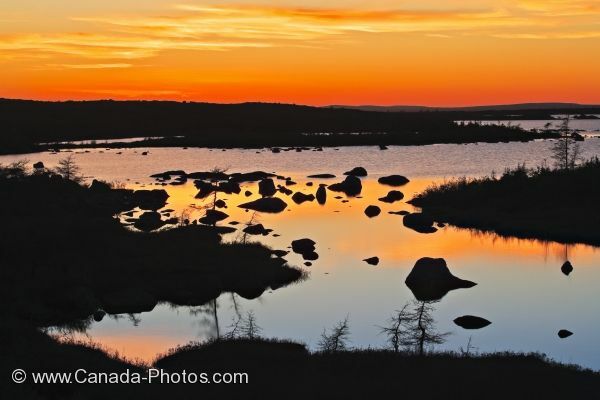 A mass of small islands and boulders in and around a pond along the Labrador Coastal Drive in Southern Labrador, creates the perfect setting for a golden sunset. A pond along the Labrador Coastal Drive in Southern Labrador lays motionless as the yellow lighting at sunset reflects off the surface where the bared rocks are silhouetted. The thin wisps of clouds are bright yellow in color as darkness begins to unfold over the landscape. A trip to Southern Labrador is not complete until the Labrador Coastal Drive has been traveled. The scenery, sunsets and wilderness is breathtaking along this route especially between Red Bay and Mary's Harbour. Picture of the sunset glow off a tranquil pond along the Labrador Coastal Drive in Southern Labrador, Canada.